Stephen and Jon leave me in Fort Williams. "You are doing something very special". 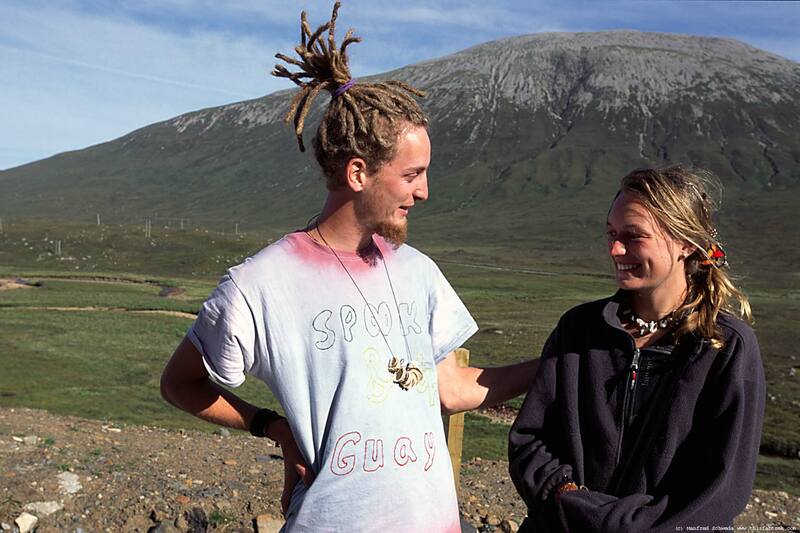 And both of them express their admiration pointing out that I was not just doing the trip for myself but for everyone who would follow it on the web and live through the emotional difficulties as well as the pleasures. I take their advise and leave Fort William, but it makes me sad because I have become so used to my new friends. For now this thought gives me my enthusiasm back. 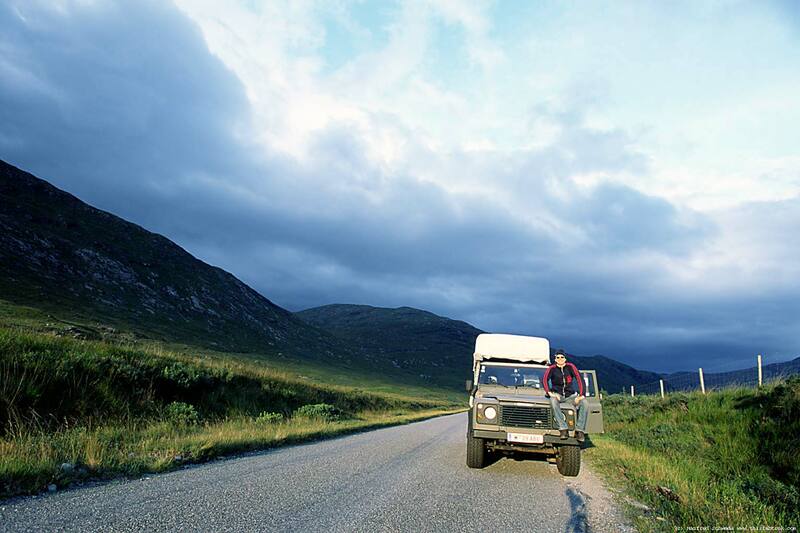 I drive to the west on the northern shore of Loch Eil first then turn round and back west on the lochs southern shore on a beautiful single track road. The road leads south along Loch Linnhe. At Lochaline I cross over to the Isle of Mull further south I am spending the night in Finnporth at the south-western end of Mull. Suddenly the sun manages to shine through - for a moment. 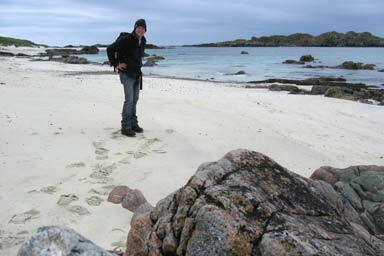 The next morning I take the first boat to Iona, a small island off Finnporth's coast. 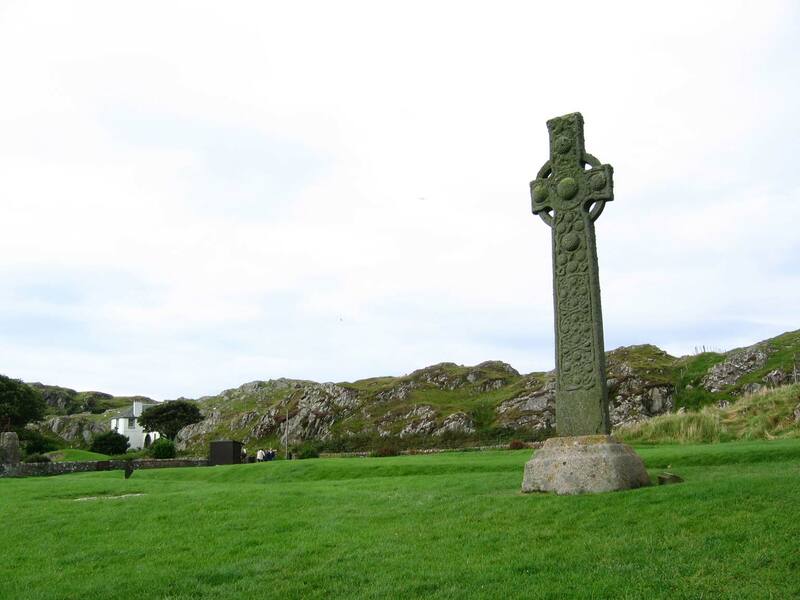 Iona has a history of Christianity for more then 1,000 years.The abby they lay in ruins after reformation was only rebuilt this century by the Iona community that works from the island promoting Christianity in a contemporary, modern way, accessible for young people. The spirituality takes hold of me immediately after getting onto the island and outlasts the visit to the abby when I walk along its secluded beaches, moors and cliffs for 3 hours. Reality is back quickly when I board the ship back and I am glad that I have taken the first boat this morning when I run into hundreds of tourists that pile off the tour busses onto the ferry and then the isle itself. It would not have been as tranquil and peaceful and you would not be have been able to feel the spirituality, the calm that has engulfed this place in the morning. 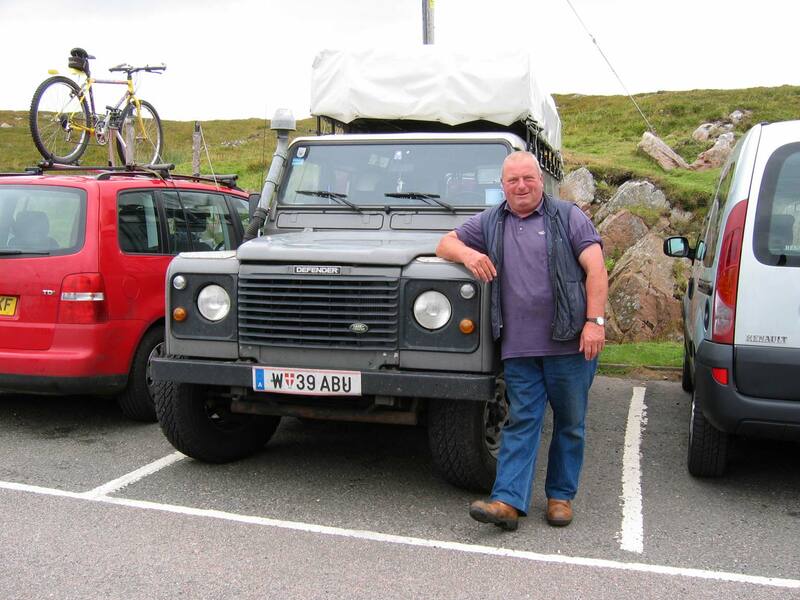 Ian Mulligan, Land Rover lover. 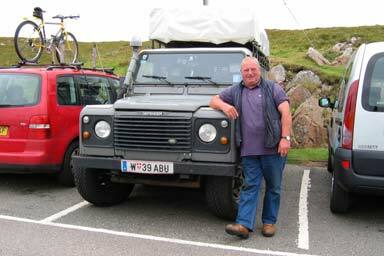 Before I leave Finnporth I meet Ian Milligan (picture), and Stuart McDougal, two local Land Rover enthusiasts. "Now, if I die tomorrow. 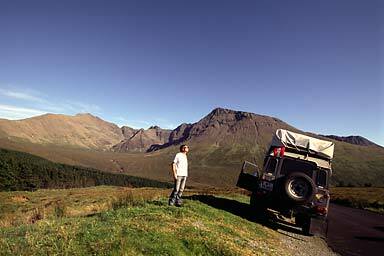 That's fine, now that I have seen a six-wheeler" says Ian Mulligan at some point and I promise to send the picture. Later I pick up Riu from Portugal and give him a lift all the way to Tobermory, a little fishing village on the northern coast of Mull. We put on one of Bruckner's symphony (Riu likes classical music). And that is a whole new experience. Listening to classical music (loud of course) in conjunction with looking at the beauty of the scenery makes us tremble and never forget. Next morning, 25th I take the ferry over to Kilchoan on Adnamurchan. 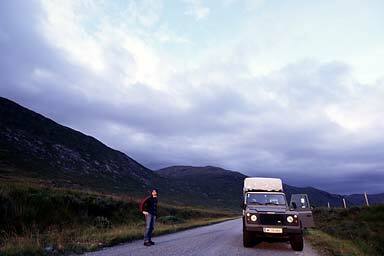 This is mainland Scotland again. 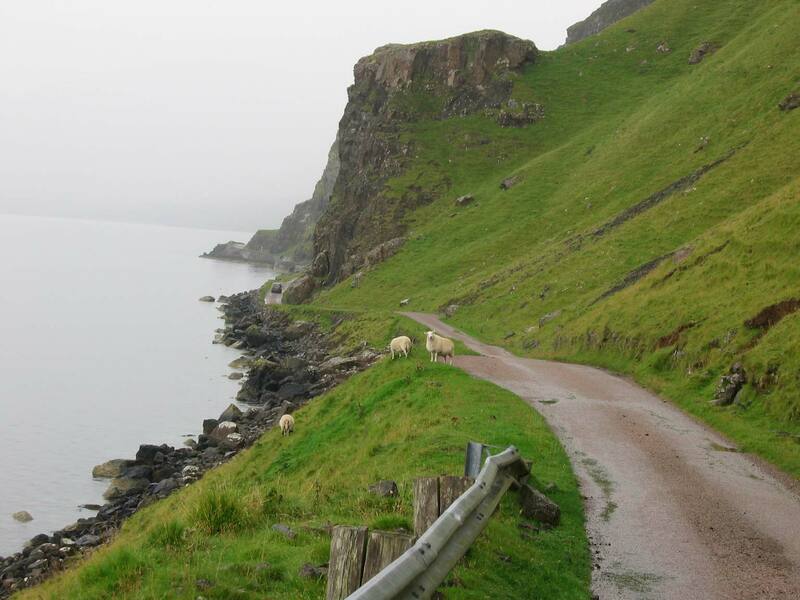 Although with so many lochs you never really know whether you drive along the shore of an island or the mainland or whether the water next to you is connected to the open sea or not. 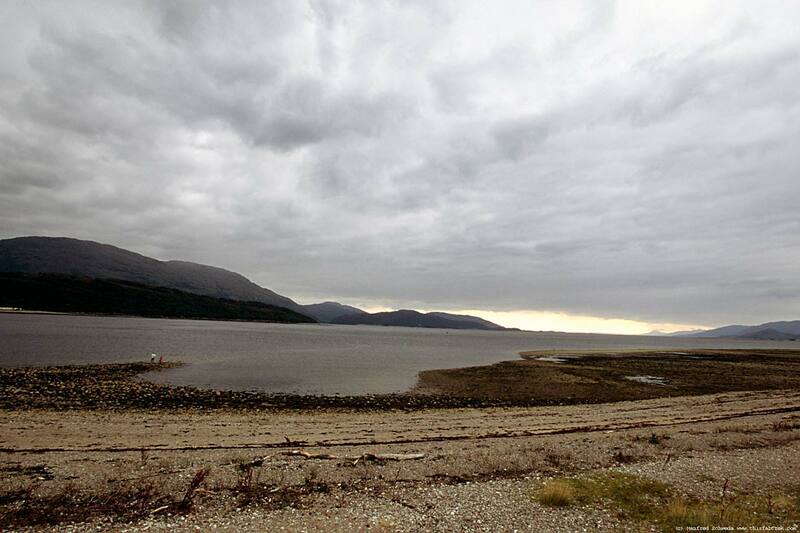 This is of no further interest to me as the landscape remains stunning whether sea or loch or island or mainland. And the wind and weather cannot not harm me anymore as I stay inside my truck when it rains and only venture outside when the weather allows to do so. 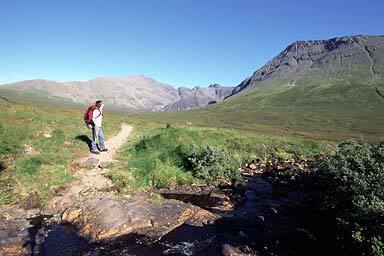 I reach Mallgai later in the day and board a ferry to the Isle of Skye one of the largest islands and greatest scenery attractions in Scotland or at least the most marketed. The weather is the best I had in Scotland so-far. I give a lift to Anna-Lena and Charles two young Germans spending their holidays on the Island. Later the sunset is extraordinary and I manage to take some pictures from the Cullin Hills (Munroes over 900m high). 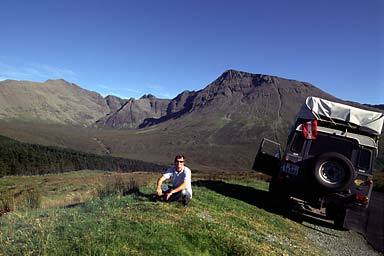 Tonight I settle on the campground in Bualintur at the foot of the Cullin Hills and at the southern shore of Skye. I am reading "The dead of Winter" a book by Dominic Cooper, which Nadine gave me. The right book for traveling the Scottish Islands. PS re Cooper: On the Internet I find absolutely nothing on him just that he won the Somerset Maugham Award in 1976. The Cullins, my Land Rover and superb weather. Time to get the Nikon out. The weather always the weather. it makes me change my original plan to climb on the top of the Cullin Hills the next morning. This time it is really bad with horizontal rains and gusts. I visit Talisker distilleries instead and stock up with 2 bottles of single malt whisky for the rainy days to come. 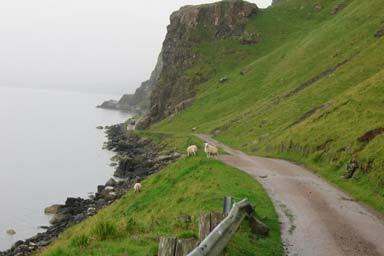 I make my way quicker around Skye then I previously envisioned, drive trough Poitree and take the ferry from Uig to Harris 43km away. 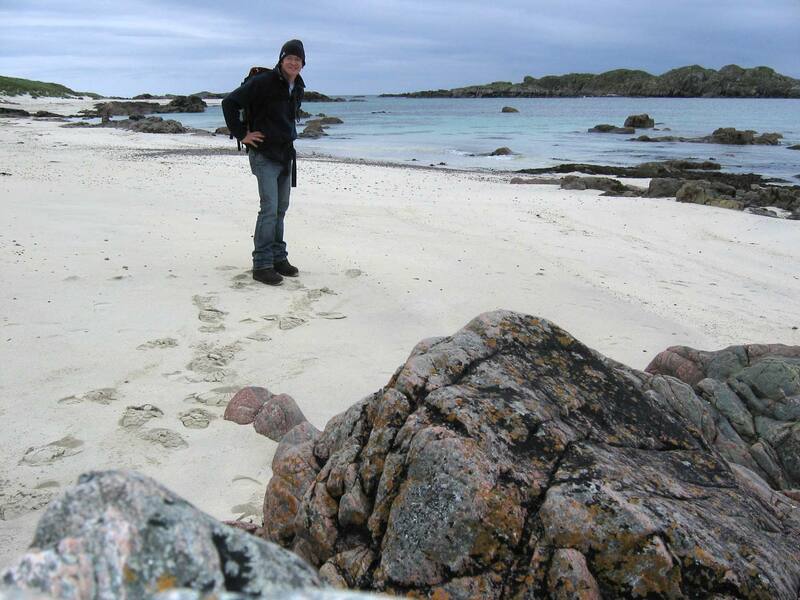 I have set foot onto the Outer Hebrides where I would stay for 2 weeks and a bit.